The Print Club of New York will be holding its first event for 2017 on January 20th at The Morgan Library. We will be given a guided tour of the current exhibition Word and Image: Martin Luther’s Reformation with John McQuillen, Assistant Curator of Printed Books and Binding. Five hundred years ago a monk in a backwater town at the edge of Germany took on the most powerful men in Europe — the Holy Roman Emperor and the Pope — and he won. Martin Luther’s Reformation ranks among the most successful religious movements in history, altering western society and culture forever, and was a testament to his creative use of communications, notably rapidly evolving print technology, to promote his views. To mark the historic anniversary of Luther posting the Ninety-Five Theses to the church door in Wittenberg in 1517, Word and Image: Martin Luther’s Reformation explores the evolution of his movement and its triumphant propagation in text and art. 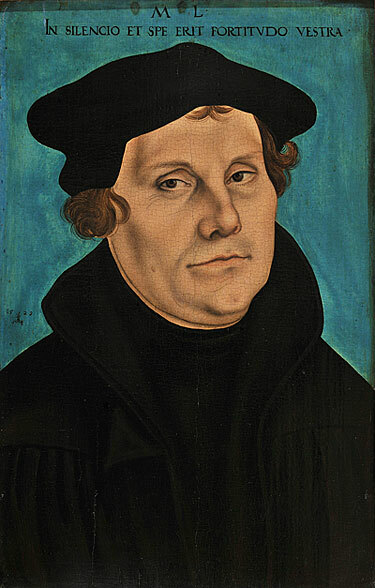 Word and Image includes more than ninety objects, highlighted by one of the six existing printed copies of the Ninety-Five Theses, and nearly forty paintings, prints, and drawings by the celebrated German Renaissance artist Lucas Cranach the Elder. Also on view will be Luther’s manuscript draft of his famous Old Testament translation, sculptor Conrad Meit’s exquisite statues of Adam and Eve, and over thirty of Luther’s most important publications. The majority of the works in the show are loans from German museums and have never before been exhibited in the United States. If you have already RSVP’d to confirm that space is available and wish to pay for the tour fee by credit card, please use the PayPal link below.